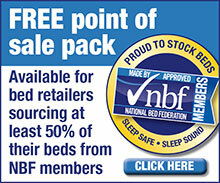 MattressOnline is one of the UK's longest established ecommerce businesses. Inset: Steve Adams (left) and Steve Kelly collect the NBF Retailer of the Year award in 2016. Steve Kelly, co-founder of MattressOnline, is retiring to spend more time with his family and pursue other interests. Co-founder Steve Adams is now sole shareholder after completing a management buyout.